Westminster 2011 considerably revived the public's interest in Scottish Deerhounds when one went Best in Show. Although some people confuse these dogs with the Irish Wolfhound, they really are two distinct breeds. Learn a little about their history and the kind of companions these dogs make. Scottish Deerhounds are an ancient breed, and their exact origins have been lost over the centuries. What is known is that they are likely related to the ancient Irish Wolf Dog, but they were selectively bred for hunting deer. These dogs were highly prized by Scottish chieftains and nobility alike. The Deerhound resembles a slightly more refined Irish Wolfhound, and there's also some resemblance to the Greyhound in body type. Males stand between 30 and 32 inches on average, but some are even taller. Females generally stand at least 28 inches tall. Weight on these dogs ranges up to 110 pounds for males and 95 pounds for females, but the most important thing is that each dog's weight is proportionate to its height. Black markings on the face and ears are permissible, but white markings are only allowed on the chest and feet, and the less white the better. 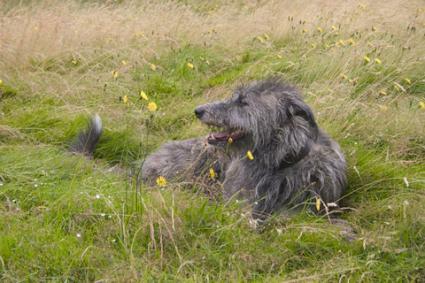 The Deerhound's long history of working closely with people makes him a great companion. You'll hear the word "dignified" used to describe this breed quite often, and it really fits. These dogs are thoughtful, fairly quiet and surprisingly not clumsy given their great size. They make very good family companions, and they are generally good with children. It's important to understand that these dogs have strong gaming instincts, so they need a completely fenced yard for them to exercise in. You should only walk them on leash because they have a tendency to take off after squirrels, rabbits and other small quarry. This instinct may extend to other small pets in the home as well, so keep that in mind. Even though these dogs are quite smart and generally cooperative, it's best to obedience train them as puppies or, like most large breeds, they will try to take the lead in your relationship. These dogs also take well to lure coursing, and this can provide an outlet for their hunting instincts. Check with your local kennel club to find out where this activity is offered and how to get involved. Scottish Deerhounds are strong and have a lot of energy, so they need a good daily walk at the minimum, and a jog is even better if you can manage it. Deerhounds are supposed to look natural, so there isn't much grooming required. You can brush them about once a week to remove loose coat and other debris. Very little bathing is required. You can always bathe your dog's feet when they get muddy and reserve full baths for when they are truly needed. These dogs have very strong nails, so keep an eye on them and trim them if your pet doesn't wear them down naturally. Like most large breeds, these dogs have an average life expectancy of eight to ten years. The most common health issues these dogs face are bloat, heart problems and bone cancer. This overview of the Scottish Deerhound gives you a general idea of what to expect from these dogs, but the only way to be sure if this is the right dog for you is to visit a breeder and spend time around some puppies and adults. A breeder can tell you what it's like to live with Deerhounds on a daily basis, and then you can decide if one will be a good fit for your lifestyle.